Stay at Protea Hotel Clarens which is located in the charming artistic village of Clarens and is in close proximity to Golden Gate National Park. Siyabona Africa is not able to assist with any accommodation bookings within Golden Gate Highlands National Park, we recommend as an alternative staying at the nearby Protea Hotel Clarens and visiting the park as a day visitor. 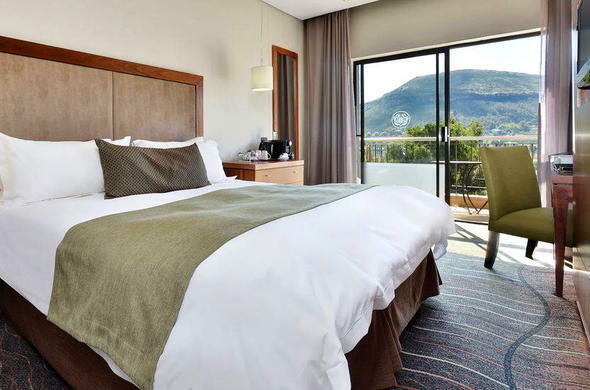 Protea Hotel Clarens is a 4 star retreat offering air-conditioned accommodation in Standard, Deluxe, Superior Deluxe and Executive king bedded rooms plus universally accessible rooms. Standard Rooms have mountain views with aircon, wi-fi, tv, an en-suite bathroom, tea & coffee making facilities and an electronic safe for your convenience. This Eastern Cape nature reserve is situated on the scenic Highlands Route in the northern part of the Drakensberg, Free State, South Africa. Enjoy amazing sunsets over the Maluti Mountains.